This time Matt O’Malley is back to talk about Knot Dice, his latest project that is currently on Kickstarter. Thank you for agreeing to be a guest on Go Forth And Game, Matt. It’s great to talk to you again. Tom: Between Two Cities, the game you co-designed with Ben Rosset, did super fantastic on Kickstarter. I imagine that feels pretty good right? Matt: The campaign was a huge success, and I can’t wait to go to Gen Con and Essen later this year to play the game with backers and introduce it to more players. The backers were so active and engaged – I hope I can develop that kind of support for Knot Dice. Tom: Jamey is one of the best people in the business and community. I can’t say enough good things about him.I’m very excited for the game. It’s unique and at $29 it’s a no brainer to me. We talked a lot about BTC in an earlier interview. Is there anything new to add? Matt: Just that we’re making great headway on those stretch goals and I hope we can knock them all out by the end of the campaign. 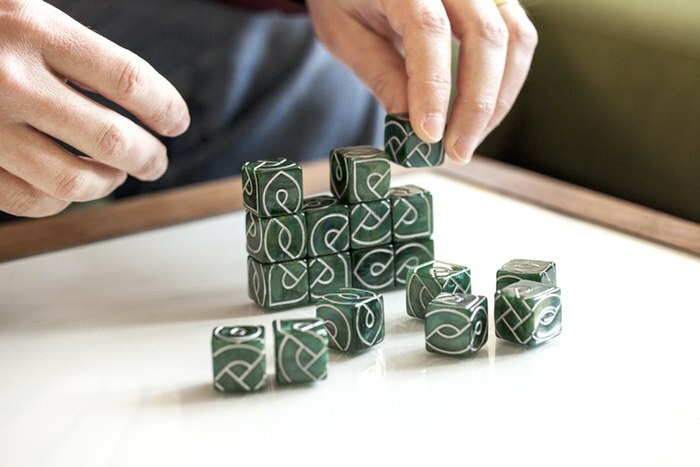 The backers have been so active and engaged – I hope I can develop that kind of support for Knot Dice. Tom: Knot Dice. That’s what we are here to talk about most.Tell me about Knot Dice. 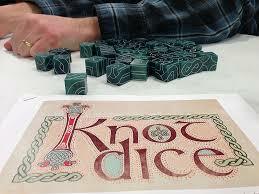 Matt: Knot Dice is a box of custom dice that form Celtic knot designs when placed next to one another. There are a bunch of games and puzzles for them, with more to come. But they also look and feel great just playing with them on a table or displayed on a shelf between plays. 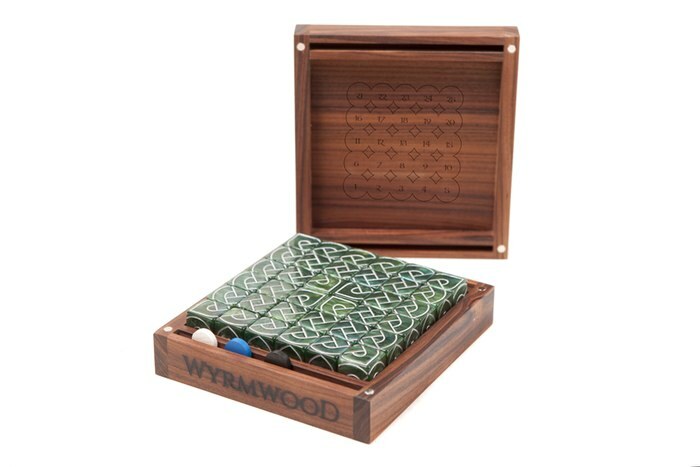 The Kickstarter’s focus is a box containing two sets of 9 dice each (total of 18 dice) which is enough to play all of the games and puzzles in the box. And backers can add on additional sets of 9 to increase the size of the designs they can make and the number of players for some of the games. I’ll also have a smaller backer level for those who just want 9 of the dice to play with. Tom: So it’s really a game system. That’s cool. If you back it then you actually are getting more than one game, correct? Matt: Yes. The boxed game will include the rules to several games, by a number of designers (including myself), and I will also continue to post new games to the Black Oak Games web site. The boxed game also includes a number of unique puzzle types, with numerous puzzles of each type. 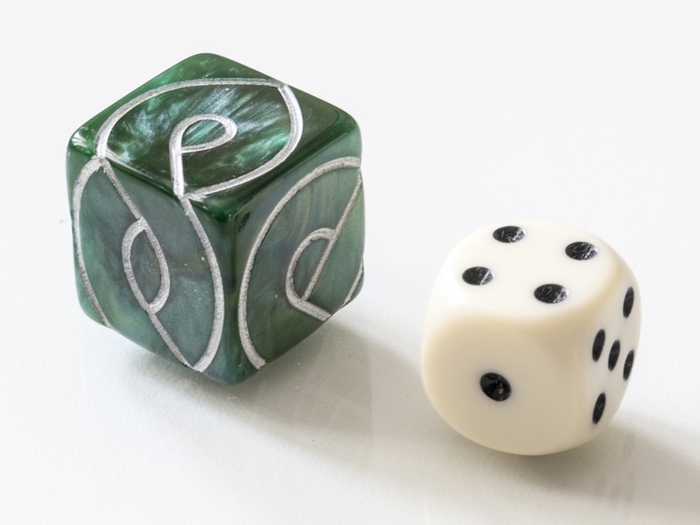 I also enthusiastically welcome everyone to design your own games and puzzles for Knot Dice and post them to BGG and otherwise make them available to players. Tom: Those dice are amazing looking. What are they made of? Who made them? How can I get some? Matt: The dice are plastic, though they have a nice heft to them (and many people think they look like stone). At 20mm, they are much larger than typical 16mm dice. After several years of searching I finally found a manufacturer in China who can produce them at the quality I want for a reasonable price. If you want some, just back the Kickstarter! Tom: I would not have guessed plastic from the pictures. They look like they are made of stone. Really awesome. Matt: I wish I could get them made of stone, but I have no idea how much that would cost. Anyone out there a stone carver? My other concern with stone is the possibility that a piece of the die could chip off, since the lines extend right up to the edges. 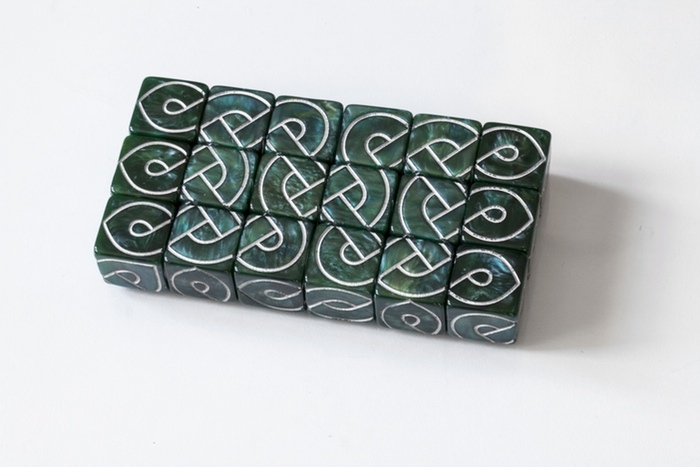 That said, if the Kickstarter does really well and there is a lot of demand, I might make a limited run of Knot Dice with some crazy materials. Matt: Right now I’m really interested in games that produce interesting, complex interactions between the players. But I admit to having a weakness for shiny things. Games that just look fantastic have a very strong appeal, but I’m also usually looking for games that I can play in a relatively short amount of time now. Tom: Short game play is a trend I’m seeing too. What is the least fun part of designing a game? Matt: For me, it’s asking people to play those really early iterations of the game, when I know it’s full of flaws but I really need feedback. I feel very awkward asking people to donate their time because I know how precious it is. Tom: That’s me too. I am very reluctant to ask people to playtest unless that’s the goal of our get together. What are some of your favorite games? Matt: Some of my favorites right now are Finca, Jaipur, Yspahan, XCOM, and Eight Minute Empire: Legends. All great games. Tom: Those first three games are so fantastic and under everyone’s radar. Finca is so under-appreciated. I really like it and need a copy of my own. Yspahan too. Sweet games. Matt: Yep. What are a few of your favorites, maybe others flying under the radar? Tom: Favorites: Most Felds, most Dice Hate Me Games, Memoir ‘44, No Thanks. Under the radar – The Little Prince, Farmageddon (Grant has a very fun game there.). Games from 5th Street and Small Box Games really need more exposure and press. John Clowdus makes good gamerly games and Phil at 5th Street did a fantastic job on family games. Mob Town is not out yet but it is super. I’m really sad to see 5th St. go away. Oh, all of Daniel Solis’s games are great and need more people playing them. Mechanics or theme first? Which is most important? Matt: Neither. Both. I think I’m a theme-first designer, but I frequently find myself working from a core mechanic initially and then finding the theme to flesh it out. As for which is most important, a game will rarely survive without both. Theme gets it to the table the first time, mechanics keep bringing it back. Tom: Yeah. That’s pretty much what everybody says. I think it’s hard to divorce the two. At least for me. What designers do you admire? Matt: Eric Lang, Alan Moon, and Uwe Rosenberg for making a career of it. Vlaada Chvatil and anyone who makes really varied games. I have so much respect for anyone who has gone through the entire process of designing, playtesting, and developing a game all the way through the process and finally gotten it published. It is a huge amount of work, and it takes a lot of dedication to see it all the way through to the end. Tom: I’m starting to recognize Rosenberg as one of my favorites too. I agree with you. Just working on my own game I see how hard it is. How do you decide when a game is done? Where did the idea for Knot Dice come from? Matt: A friend of mine, Campbell Maloney (http://alphabetgallery.com), designed an alphabet that uses repeated designs oriented in different ways to form the letters of the alphabet. Inspired by that and by Celtic knot designs, I wanted to do something similar in a game format. We talked about it for years, and eventually I designed a puzzle app called Celtic Knots (which is still available on iTunes). It was a wonderful experience (though a complete financial failure), but rather than continue to develop applications and games in my free time (which is so similar to my day job developing web sites), I wanted to create something physical. My first thought was to create wooden puzzles with flat square pieces similar to the faces of the Knot Dice, but unless you had a lot of puzzle pieces the designs would always be the same. Next came the idea of flat wooden puzzles with designs on both sides of the pieces…which eventually brought me to blocks. I was still thinking puzzles here, and imagining a 3x3x3 cube, with 3×3 celtic knot designs visible on each face (including the interior faces if you slid one 3×3 wall away from the other two). While I still think it would be a fascinating puzzle, it would be maddening to many people, and the designs on the different faces of the cubes wouldn’t match up over each edge. That plus at the time getting someone to produce it out of wood was financially out of reach. So I let the idea stew. Meanwhile I was also designing board games in my free time. Nothing noteworthy, just playing around with ideas. At some point (I don’t remember when exactly), the idea grew to get the cubes made in plastic, and suddenly they were dice! Dice that were still great for puzzles but would lead to puzzles that were solvable in a much shorter time than the 3x3x3 cube. The original dice had 4 different designs, but the cost of molds and the expense to produce a single die is as much as I can take on at the moment. Eventually I hope to get them all made via future Kickstarters if there is enough demand. Tom: What was the most challenging part of designing Knot Dice? Matt: Figuring out when to stop. Most games I’ve designed have had a pretty definite end point, but there’s no sign of that with these dice. I still haven’t stopped working with them, designing and tweaking games and puzzles, but I have decided that it’s time to get them manufactured and out into the world so more people can play them and design with them as well. Tom: That’s a good problem to have. Most of the time it’s pushing past a block not turning off the idea spigot. Give us the elevator pitch for the game. 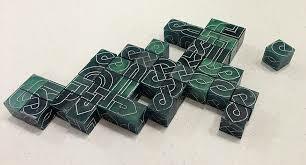 Matt: Knot Dice is a box full of games and puzzles that create art while you’re having fun! Tom: Have you been rejected by a publisher? Is so, how did you handle it? Matt: Of course! It’s always a letdown, but I don’t take it to heart. The publishers I’ve dealt with have all been really great to talk to, and will explain if they think that something about the game needs work (they’re usually right), or if the game for some reason just isn’t what they’re looking for right now. The trick is to figure out what went wrong with that particular pairing of game and publisher, and work hard on making the next pairing better. All the while honing and playtesting your game. Matt: To start playing a game as soon as possible. I frequently sit down and do tons of work on icons, making huge sets of cards, balancing, and so on before I even get to the first playtest. If I could teach myself to start playing sooner, with some minimal version of the game, I could cut out a huge amount of development time and figure out which games have serious flaws much more quickly. Fail faster! Tom: I have that issue too. My big roadblock is playtesting. I find it really hard to ask people to play my game. Thanks Matt for being my guest and giving us the lowdown on Knot Dice. It sounds pretty awesome. Readers, you really should check out Knot Dice right here. And you can find out more about Matt and what else he is up to at Black Oak Games. Today I’m joined by the guys behind Stonemaier Games next project – Between Two Cities. Ben Rosset, Matt O’Malley, and Stonemaier’s Jamey Stegmaier. Let’s get to it. Tom: Hi guys. Why not introduce yourselves first. Ben: I’m from Chicago but have lived in Washington, DC since 2003. I’ve been a gamer since about 2006 and a game designer since about 2008. Just recently I’ve moved into the gaming industry full time as a Project Manager with Panda Game Manufacturing, which I’m incredibly excited about. I’ll still be designing my own games during my free time, as well. Matthew: I live just outside DC with my wonderful wife and two great kids. I played all sorts of games as a kid (D&D, Othello, Backgammon, Dungeon, Warrior Knights, Diplomacy) leading up to Avalon Hill’s Civilization in college. Then I went through a bit of a dark age, but a friend reintroduced me to games through Acquire, Modern Art, and Settlers. My day job is developing nonprofit web sites with my wife at Grand Junction Design (our company), but my evenings are dedicated to games and music with family and friends. Tom: D&D and rpg’s lead me back to board gaming. I still love playing them. Just don’t get to that often. Jamey, we are pretty familiar with your games. Ben, tell us about your games. Ben: As a designer, sometimes my inspiration for a new game comes in the form of a theme, and sometimes as a mechanic. My first published game was Mars Needs Mechanics, released in 2013. It’s a medium weight Economic game with a unique system for controlling the prices of goods, called the “Sales Order Line.” My next two published games, Brew Crafters and Brew Crafters: The Travel Card Game, were released at the end of 2014/beginning of 2015 from Dice Hate Me Games. As I write this, they are still being delivered to overseas kickstarter backers, and I’m looking forward to the rest of the games becoming generally available in stores soon. Theme was definitely my inspiration for both of those games. I got the original idea for Brew Crafters while taking a tour of Dogfish Head Brewery in Milton, Delaware. Between Two Cities will be my fourth published game. Tom: Mars is fun. I enjoyed it. I’ve seen you and Chris (Kirkman) play Brew Crafters when you were honing it but have yet to play (*ahem* Chris!). It looked like a game I would enjoy. 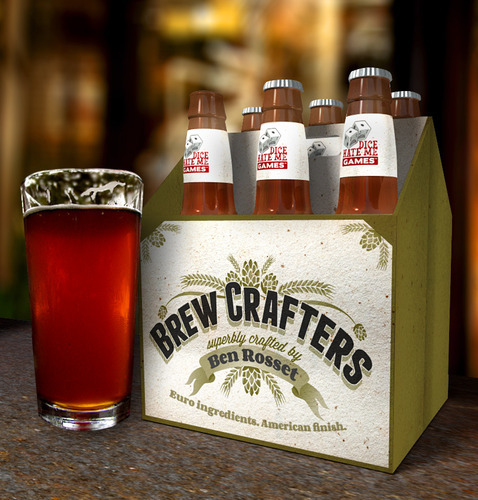 I have just received Brew Crafters: TTCG and am looking forward to playing it. Your turn Matthew. Matt: My first published game was actually an iOS puzzle game, Celtic Knots, that I designed and published myself. However, after that experience (and having a day job creating web sites) I really wanted to create something physical, which is what led me to board games. I’d been designing games in my head for years, but attending Unpub in 2013 was what drove me to try to get some of my designs published. Soon after that, I signed The Princess Bride: A Battle of Wits (which will be released by Game Salute in the summer of 2015), followed by Diner (public release in early 2015 by Dice Hate Me Games). A Battle of Wits is a nice, light, auction and deduction card game to the death. 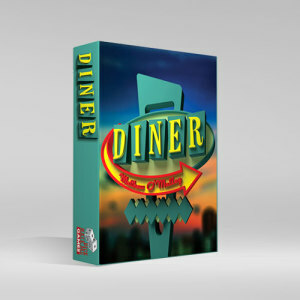 Diner is a fast-paced almost-real-time game with a lot of energy. Between Two Cities will be my third published game. Tom: Diner is so good. I ‘playtested’ it for the 54 Card Challenge and it stood out as amazing. Somebody please tell us about Between Two Cities. This is the mock-up of the box cover for Between Two Cities. 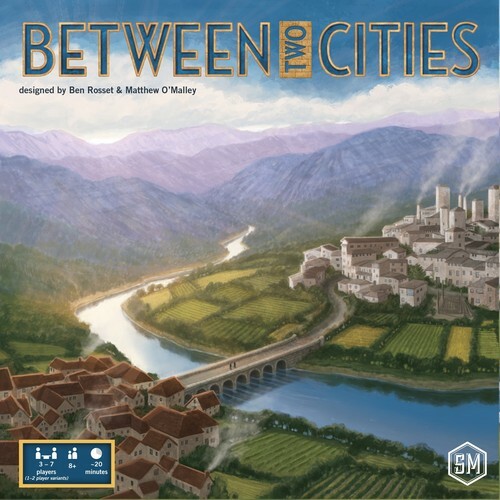 Ben: Between Two Cities is a tile drafting and placement game about building iconic world cities for 3-7 players (with 1 and 2 player variants) that plays in about 20 minutes at all player counts. 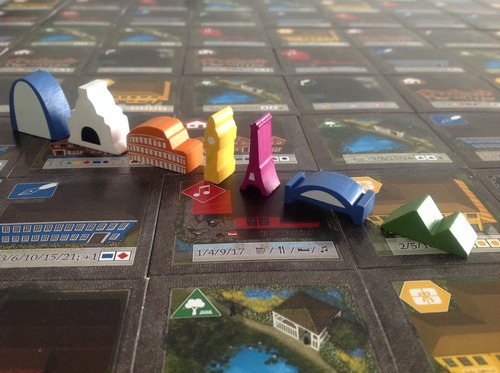 It has a unique double partnership mechanic where each player works with the player to their right to build one city together, and with the player to their left to build a different city. At the end of the game, each city gets scored, but each player only receives the points for their lowest scoring city. This forces players to put equal amounts of effort into both of their partnerships. Because of the double partnership mechanic, there is no “screw your neighbor” feeling in Between Two Cities. You have every incentive to help both the player to your right and your left. But in the end, it’s a strictly competitive game with only one winner. Tom: That sounds really fun. I am very interested in seeing it in action soon. Where did the idea of the game come from? Ben: The original idea that we had was the double partnership mechanic. We thought it would be really interesting if each player had to split their effort, attention and resources equally between 2 partnerships with 2 different players. The rest of the game came alive from there. Matthew: Originally, the players were all gardeners designing Roman gardens. We had this great mechanic, but it didn’t really flow until we changed the theme to city-building. I think it was the melding of the mechanic with the theme that really brought it to life, as Ben said. Tom: How is it working with a design partner? Ben: For me, it’s been amazing. Matthew is an incredibly talented designer and has also become a good friend. I couldn’t ask for a more perfect design partner. We are just enough the same and just enough different to make the partnership work well. We’ve got other ideas in the hopper and I look forward to designing more games with Matthew for a long time to come! Matthew: Working with a partner is invaluable in keeping a project moving forward. It really helps to have someone else to keep pushing, to bounce ideas off of, and to take something from good to great. Working with Ben has been fantastic. He’s right that we do have a good mix of similarities and differences, especially in what we focus on in a design. I couldn’t be happier about the response we’ve gotten to Between Two Cities, and we’ll keep doing what we’re doing to bring more games to life. Tom: Jamey, what was it about Between Two Cities that made you say, “I have to sign this game!”? Jamey: This past year at Gen Con, I heard that Ben had a new prototype he was testing out. I had hung out with Ben at Geekway to the West in St. Louis the previous year and hold him in high regards, so I asked him if he would show this new game to me. I sat down and played a quick 3-player game with Ben and Matthew, who I met for the first time for that game. As I played, I realized that I was feeling something I had never fully experienced from the beginning of a game to the end: I had that positive feeling you get from working together with people to solve a puzzle in a cooperative game, but I was working towards my own clever individual victory as one does in a competitive game. The game was somehow fully cooperative (with your neighbors) and fully competitive, and it felt…awesome. I immediately called over 4 friends, as I wanted to see if I felt that same way after playing with 7 players. I also wanted to see how much time it added or if it seemed like a different game. Nope. Same game with 7 players as it was with 3. It scaled beautifully. And again it felt awesome. Tom: When are you going to launch the Kickstarter campaign? 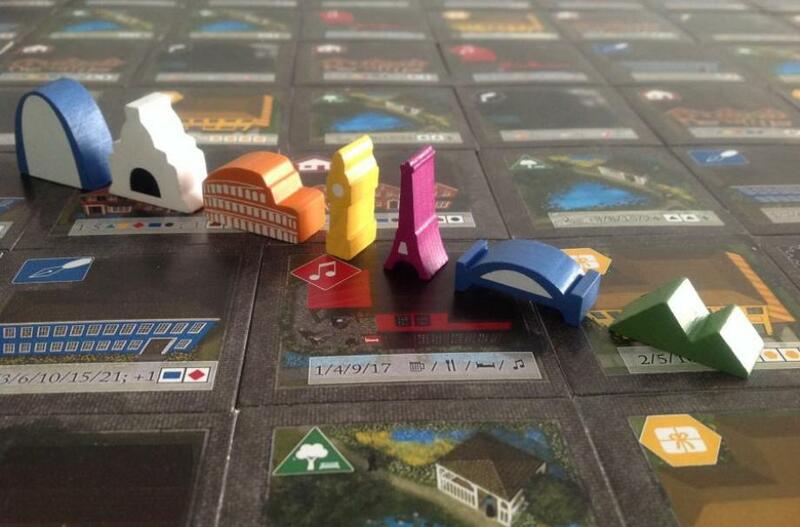 Jamey: Between Two Cities will go live on Kickstarter on February 25. Tom: So close. What sort of stretch goals are you thinking about? Jamey: We’ve tried to include a complete game in the box from day one, but after launch day we’re going to explore some fun stretch goals that will enhance the game in subtle ways. One of the “fun” stretch goals will be a set of cards that determine player order. We’re going to crowdsource ideas for those cards during the campaign. Tom: You are all about the crowdsourcing. That’s a neat idea. Give the people what they want sort of thing. Who is doing the art for the game? The graphic design? Matthew: The art is by Beth Sobel, graphic design by Christine Santana. This is the first project I’ve worked with them on, but they’ve been fantastic. I love the work they’ve done for Between Two Cities. I think they’ve worked with you before, right Jamey? Jamey: That’s correct! 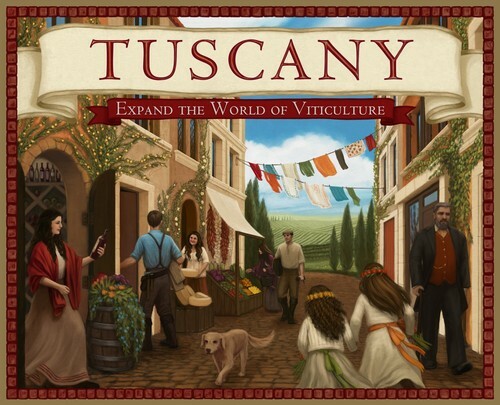 Beth did the art for Viticulture and Tuscany, and Christine has been our graphic designer from the beginning. I should point out that Matthew’s graphic design skills have also been a HUGE help for Between Two Cities. Tom: Neat. It kind of keeps a Stonemaier “brand” if you will to have the art for different games done by the same artist. Wow, there are so many graphic designers that are game designers. Matthew, Daniel Solis, Darrell Louder, Chris Kirkman, on and on. What’s up with that? Matthew: I’m not a pro like those guys – I care about layout and expressing information visually, but I just do it for the rough passes and playtesting. Daniel, Darrell and Chris make the final product beautiful as well. I think it helps them a lot in their development process because it makes their games easier to play and doesn’t detract from the experience when the graphic design is done well. Tom: What’s the best bit of advice you would give new game designers? Jamey: Play a lot of games and absorb content (videos, podcasts(like The Geek All Stars), reviews, blogs, etc) about the games you don’t have the opportunity to play. I’ve learned so much from other designers that way. Ben: Two things: First, design for yourself. Be a fan of the types of games you create. If you aren’t a deck-building fan, don’t make that your first design. You’re going to have to playtest your own games scores if not hundreds of times. You might as well enjoy the game! Second, don’t be afraid of getting your designs stolen. Your games won’t be any good if you don’t openly share them with as many strangers as possible to get honest feedback. Matthew: Not only that, but try to playtest other designers’ games. There are so many events available for this now – Protospiels, Unpub events, Metatopia, and the playtest halls at big cons. Get other people to play your games, but also play a lot of other people’s games. It will give you a lot of insight into how other designers work, and may help you build up a good network of people to help you in your process. Tom: Awesome advice. I really need to get University Labs and Tourist Traps in front of some other people soon. Unpub Mini here in April so that’s the goal. Lastly, where can people find you? Matthew: The best way to reach me is on Twitter @BlackOakGames. Tom: Any final words from any of you? Jamey: I’m just really excited to be back on Kickstarter! It’s been too long (since July). I’ve been engaging consistently with backers from previous Kickstarters, but there’s nothing quite like the collective enthusiasm and energy generated by a live project. Ben: Thanks for the interview Tom, it was fun! Matthew: Thanks! Hope to talk to you again soon. Tom: Where can we find out more about Between Two Cities? Jamey: The page on our website is here, and it’s on BGG here. Do you want to know when I’ve posted a new interview or article? You can subscribe to Go Forth And Game at the right. Or you can follow my tweets on Twitter by clicking the button there on the right. I’m @goforthandgame or @tomgurg. I’m boffotom on BGG. Sometime I have something to say there too. I very much appreciate your reading by little blog.